Wondering how Daubert Cromwell’s VCI Packaging can help you protect your metal parts and machinery from corrosion? 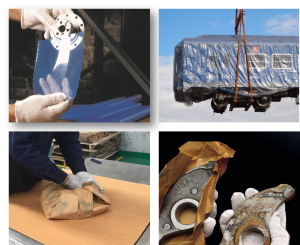 1.Metals wrapped in our VCI paper & film packaging will stay clean, dry and rust-free for months or years, depending on the storage conditions. 2.Our VCI Packaging can also protect your metal parts from scratches, abrasions, and other damage. 3.No need for expensive coatings … VCI Packaging is clean, safe, and easy to use. 4.You can wrap any size metal part because our VCI packaging is available as sheeting, wraps, liners, shrouds, flat and recloseable VCI bags. 5.You can protect your metal from harsh conditions, rough handling or moisture, with heavyweight/reinforced VCI paper, barrier wraps, and shrink film. 6.Global excellence through ISO Certification, and compliance with key regulations such as REACH and RoHS means you are working with an experienced, trusted supplier. 7.Green Initiatives: our VCI rust inhibitor paper and films are fully recyclable and sourced from sustainable forestry initiatives. Paper products exported to the EU are made with 25-30% recycled content. 8.With global manufacturing and sales offices in China, Mexico, Europe, Brazil and the USA, our team of Technical Sales Managers can provide expert support anywhere in the world. We can help you choose the right VCI to solve it. Just click on the Product Selection Form and tell us about your current situation.